Entering upon summer 2006, Buffet Restaurant "Festival" at Novotel Ambassador Gangnam offers "Special Seafood Buffet" with popular seafood dishes. The special buffet is available from June 5 through August 31. 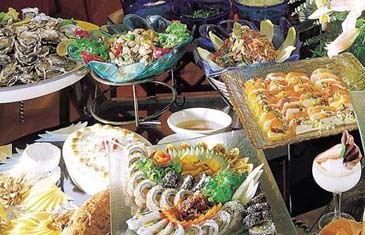 A set of fresh seafood dishes served at the buffet include cold dishes such as Octopus with Korean sweet sour ginger dressing, Seafood salad with black sesame dressing, Marinated Broccoli with Shrimps. Also featured hot dishes are the regular menus of Fillet of Pork on Mushroom Cheese Sauce, Roasted Duck with B,B,Q Sauce and other dishes combined with specially prepared seafood station with Shell Top, Shell Scallop, Shell Spider Crab, Shell Mussel, Shrimp, Octopus, Squid and more. Topped Mixed Garnish, Sweet Red Beans, Fruits Jelly, Fruits Cocktail, Rice Cake, Ground Bean Powder, Coconut Milk, Puree Raspberry, Syrup, Ice Cream and more. Come join at Festival and experience a set of fresh seafood dishes from all over the world. The price is 34,000 won for lunch and 40,000 won for dinner including tax.